The second day of the 2019 APPT Korea ₩1,800,000 APPT Main Event has come to an end after ten exhilarating hours of play. When the last chance saloon had closed for business, it was Hung Sheng Lin sitting atop the leaderboard with a stack of 2,180,000. Lin spent the better portion of the day riding a below average stack, and it was not until the final three tables that he really found some traction. He maneuvered his shorter stack into one of the bigger at his table, one small pot at a time until he found the spot he was waiting for. Kun Jiang four-bet a pair of nines against Lin who did not budge for a second as he snap-called the bet and took down a massive pot with his queens, the rest is history. The 153 runners at the beginning of Day 2 quickly became 73 before hitting a standstill. A total of 72 would be finding a min-cash, and when hand-for-hand play began, the tournament seemed to almost completely stop. It took just over an hour before the bubble popped and the person who took the unfortunate title of bubble boy was Yilu Yuan of China. Celina Lin turned a straight against Yuan, and he would take an exit with his two pair, all players were then guaranteed at least a min-cash of ₩3,290,000 ($2,895). After the players reached the money it was like the flood gates opened and they all started to drop like flies. The next break after the bubble popped saw just 40 runners remaining and Yinsheng Yang had a commanding lead after a few big hands. Some other players like Pete Chen, Phachara Wongwichit, Sera Ota, and Weiran Pu were not as fortunate as they failed to make the cut. Danny Tang took an unlucky beat against Eric Ahn when he ran his top two pair into the full house of Ahn. The well-known Tang would go from hero to zero in just a couple of hands, busting out just shy of the final three tables. Shortly after Patrick Liang took a trip to the payout desk, setting up the three table redraw. The final 27 hopefuls started off firing, never slowing down at any point as the tournament saw a fleury of players fall. 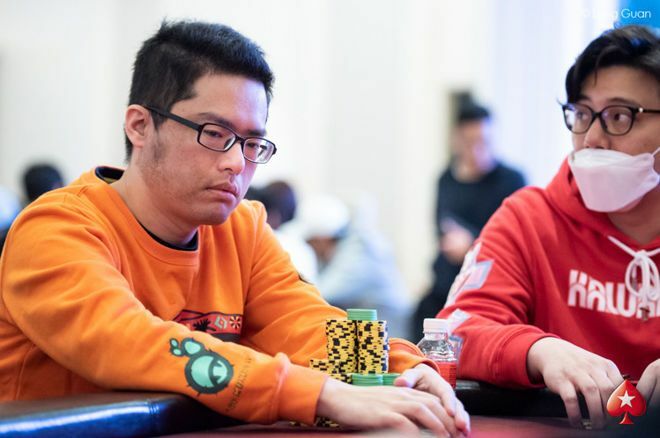 In just over 90 minutes there had been nine casualties, including PokerStars Ambassador Celina Lin, defending champ Michael Soyza, and online wizard Randy Lew. The final two tables played just 20 minutes before six more runners took an exit. One of the worst beats of the night happened during the last level of the night. Ahn moved all in with pocket jacks, Xinglong Huang called with pocket fives, and Ahn faded four cards but couldn't survive the cruel river as Huang nailed a five for the pot, eliminating Ahn out in 15th place. The final 12 players will be returning tomorrow at 1 p.m. local time to play for a trophy on the Paradise City poker tables. The blinds will begin on level 24 at 15,000/30,000 with a 30,000 big blind ante. The levels will be 60 minutes in length, and there will be a ten-minute break after every two hours of play. A champion will be crowned tomorrow, and the tournament will not end until someone is holding the trophy as well as the ₩198,100,000 ($174,32) first place prize. The PokerNews live reporting team will be bringing you all the action during the remainder of this tournament, so stay tuned as the APPT Korea Main Event unfolds. APPT Live Updates can be found in the PokerNews Live Reporting section.